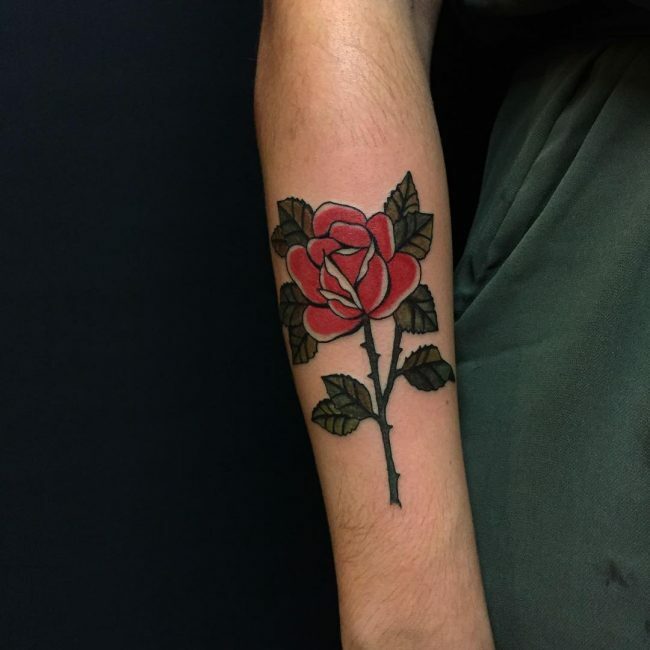 It is a commonplace to see celebrities with rose tattoo, and you might probably also want to get one that looks like what your favorite celebrity has. 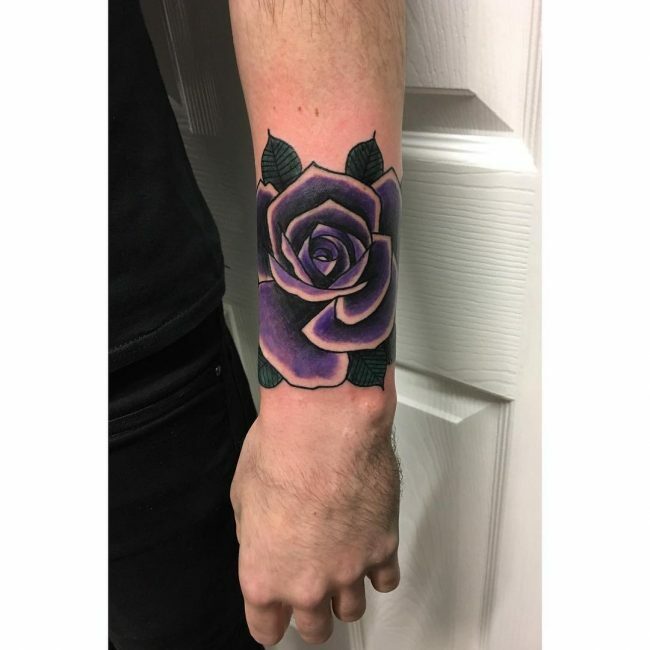 But, before you go out to get one of these beautiful totems you should know that there is way much more to the rose than its beautiful appearance. 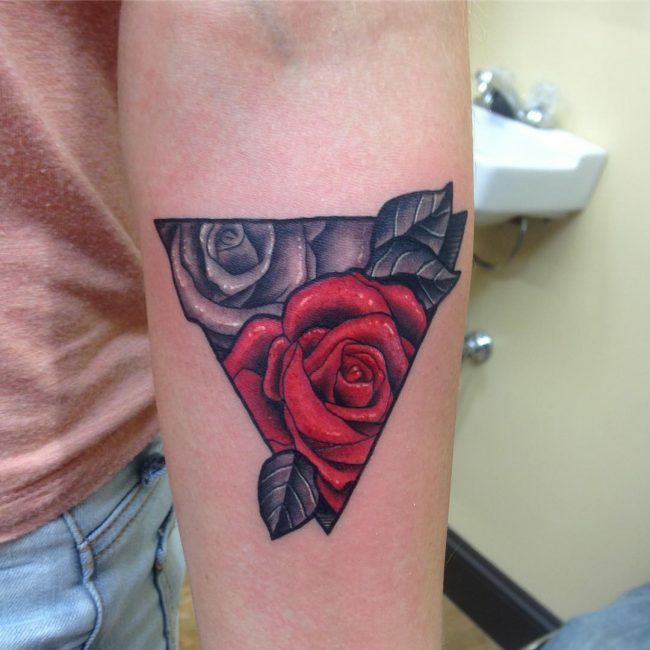 This tattoo is very symbolic, and you can use it to represent so many things apart from just having an adorable image. 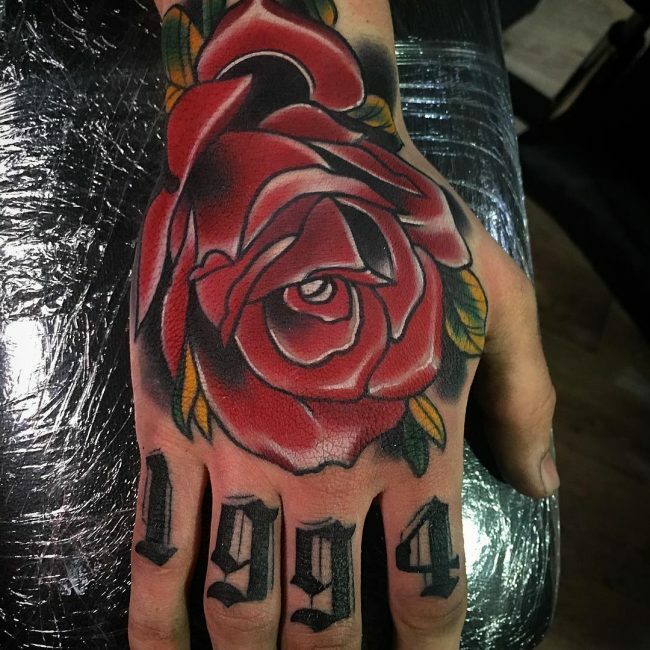 It also has a rich history which is also important to know and understand before you get it. 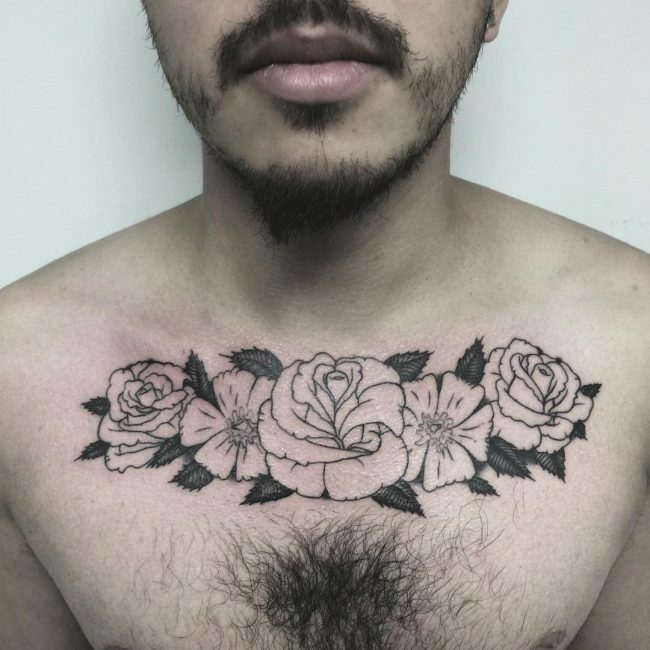 What Do These Tattoos Mean? 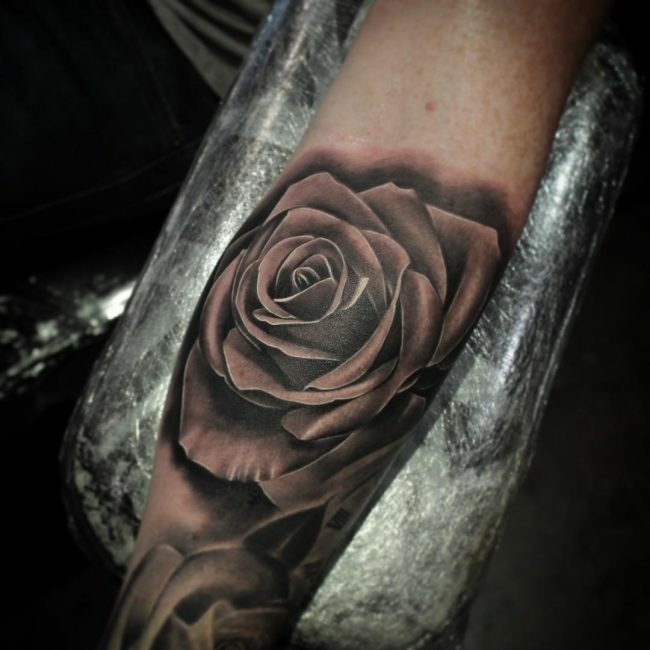 The Rose has been a part of different cultures for many years, and people have been using it to beautify their gardens for centuries. 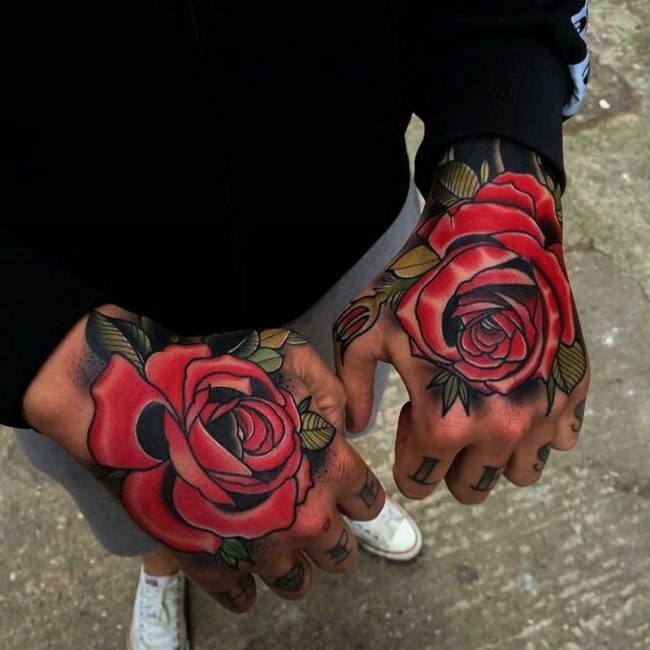 Kings and queens in ancient times would have it as one of the plants in their gardens due to its immense beauty and amazing aroma. 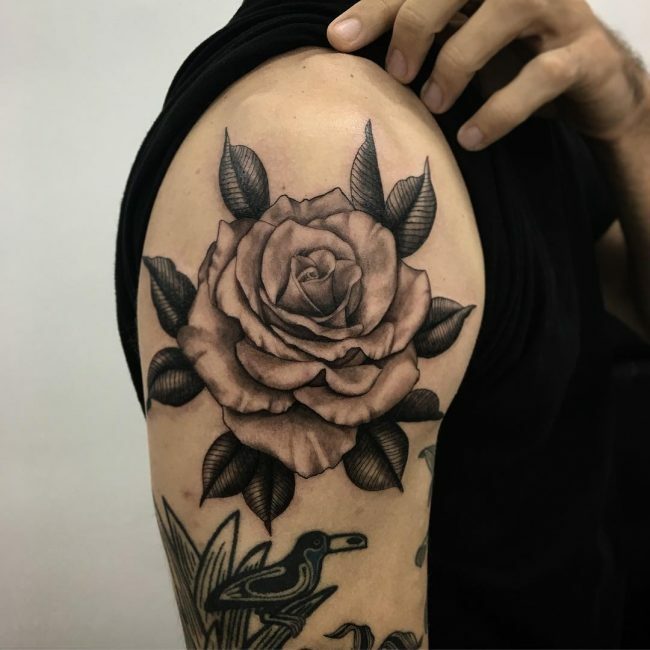 And so one can rightfully say that the fascination with this beautiful flower is thousands of years old and people have been drawing it in paintings and their body for almost the same period. 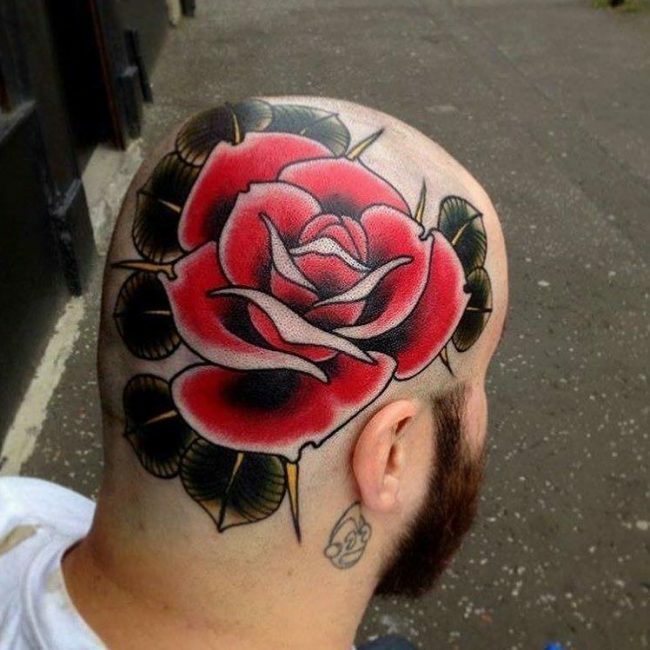 The favorite rose tattoos of today came into the limelight in the 1930’s and 40’s. 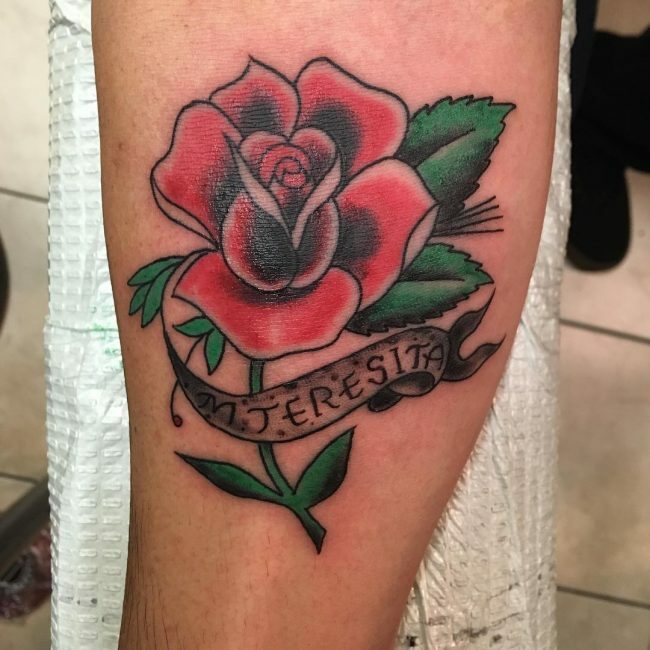 In this era, sailors would have them to represent their wives, fiancés, daughters and even their mothers. 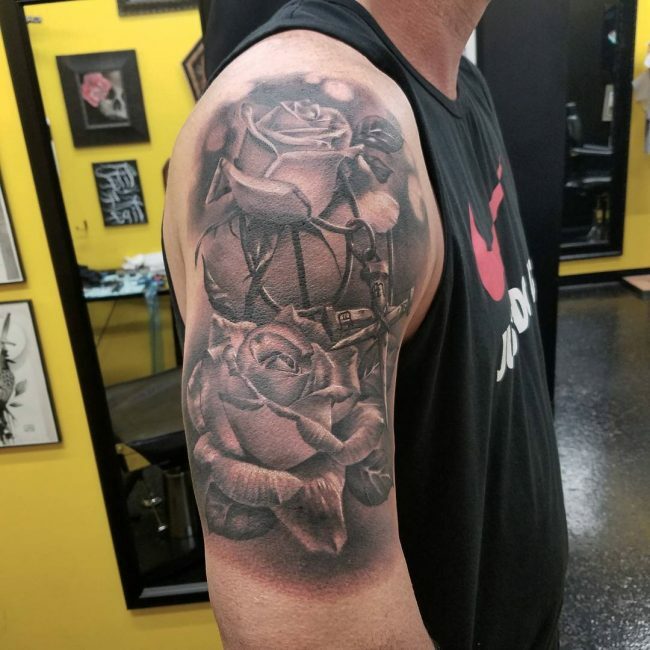 Life was very rough out in the seas, and there were no guarantees that the sailors would come back to their loved ones alive. 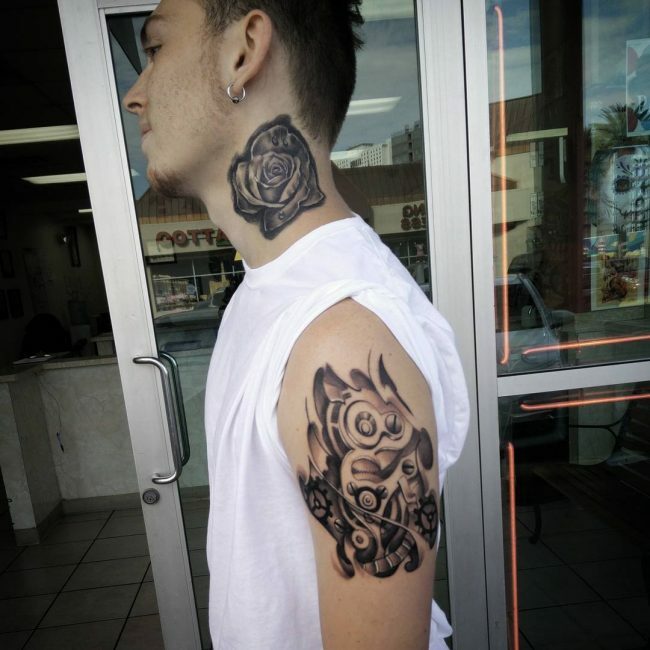 For them, having a rose totem would bring them some peace and comfort or encourage them not to give up despite what they face as they have something to go back home to. 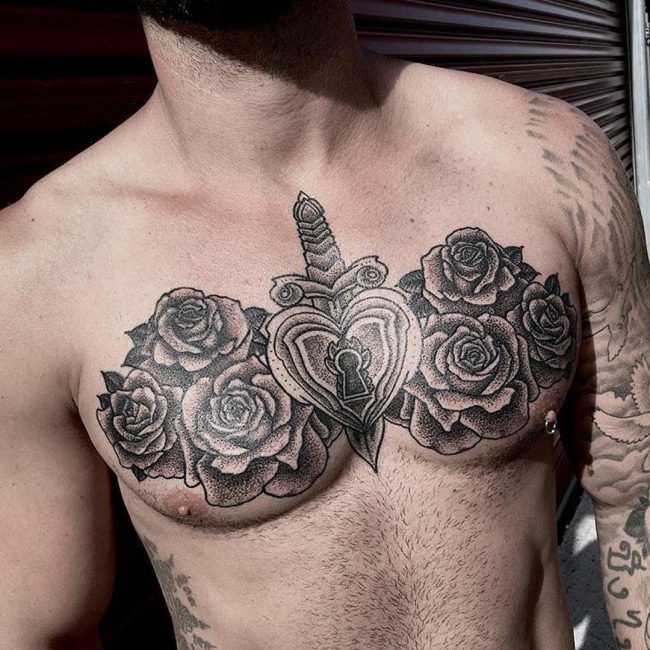 Friends and relatives of the sailors also started to copy their tattoos hence leading to the spread of its popularity. 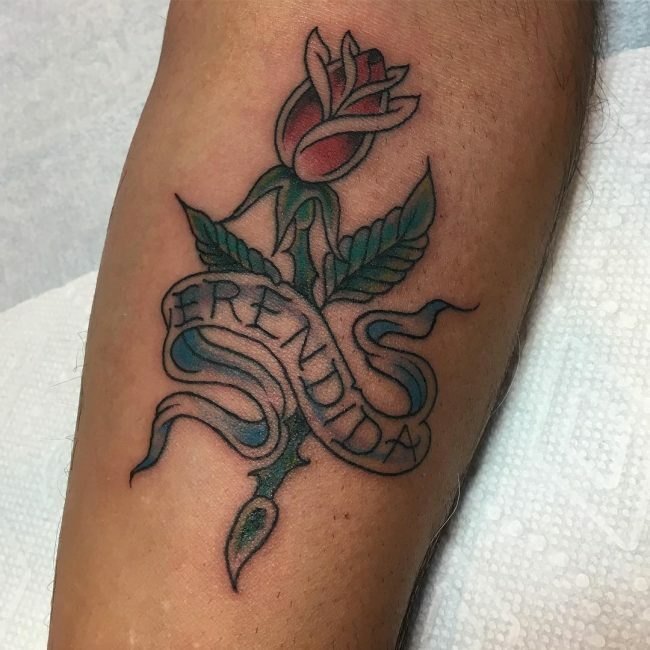 In the 21st century, celebrities are the trendsetters and most people that have the rose totem take the design from their favorite stars. 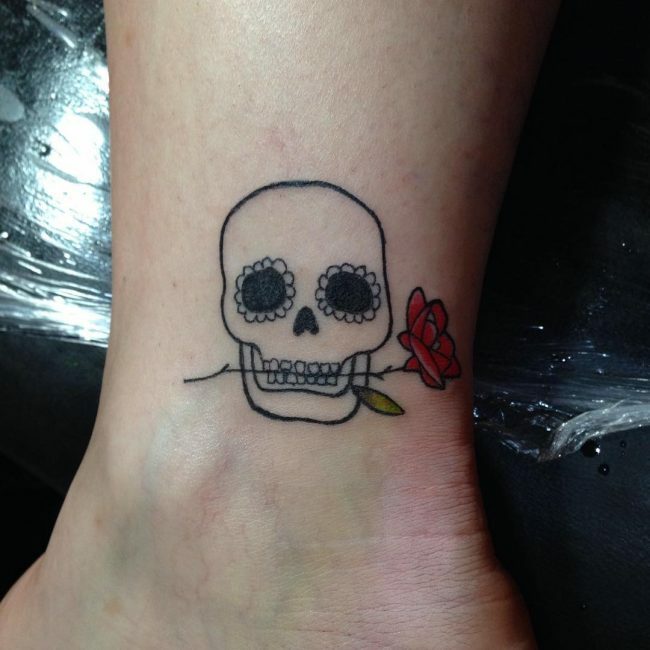 Love is the universal meaning that people associate with this tattoo and it has been so for thousands of years. 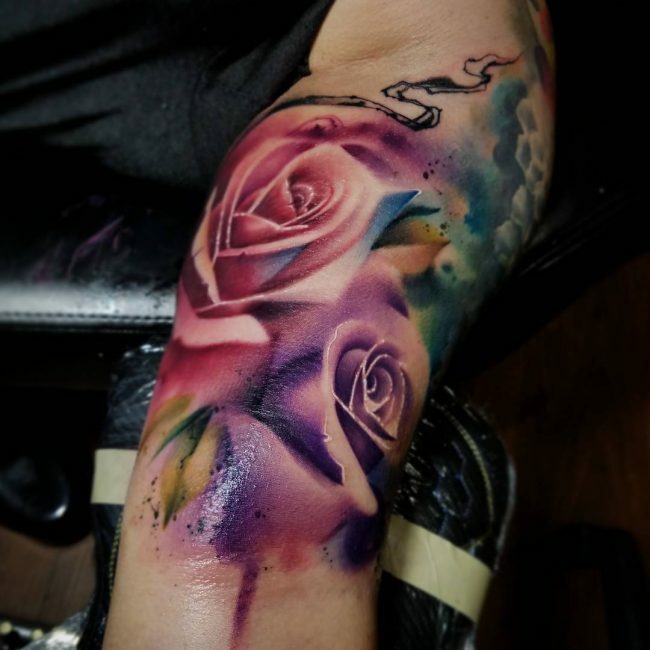 Having a beautiful and colorful tattoo of a rose anywhere in your body can be a symbol of someone dear or special to you. 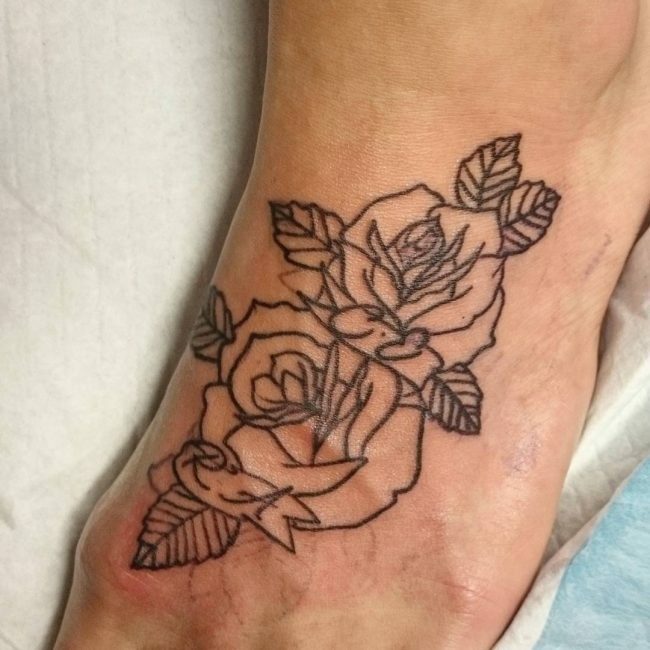 In the Greek mythology, Aphrodite, the goddess of love would have roses on her head, neck, and feet. 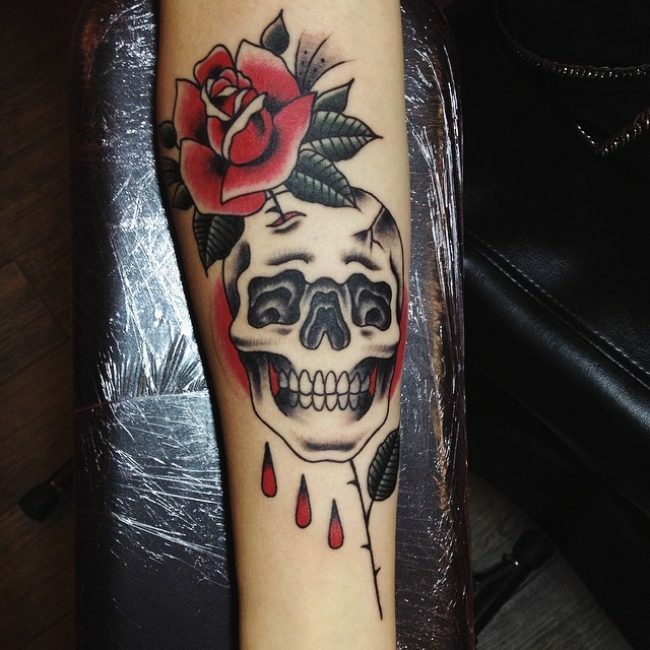 Her association with roses comes from a legend that says that a bush of rose grew in a pool of blood from her dead lover (Adonis) and so the roses are a symbol that love can conquer anything including death. 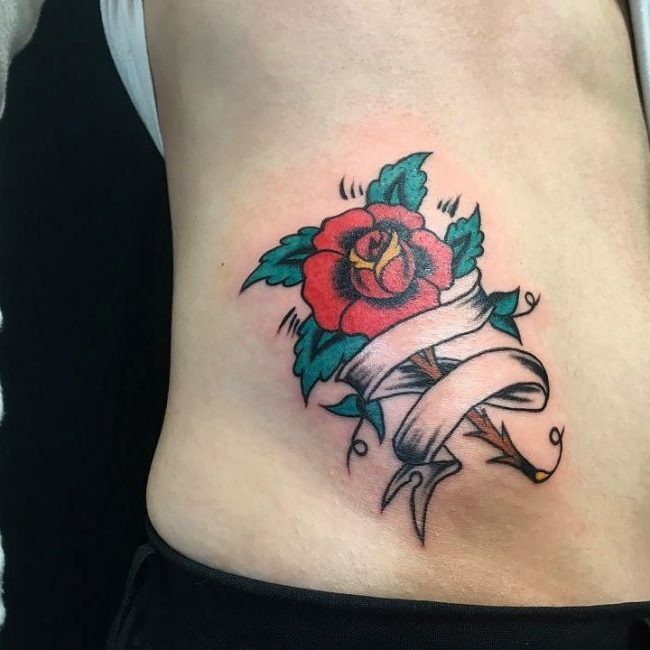 For sailors, having rose tattoos is a symbol of a loved one, and it is meant to remind them of that one important person in their life when they are out in the sea for many months. 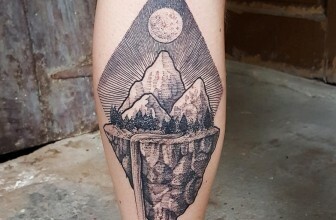 In tarot, it symbolizes balance because its beauty expresses hope and a promise of new beginnings. 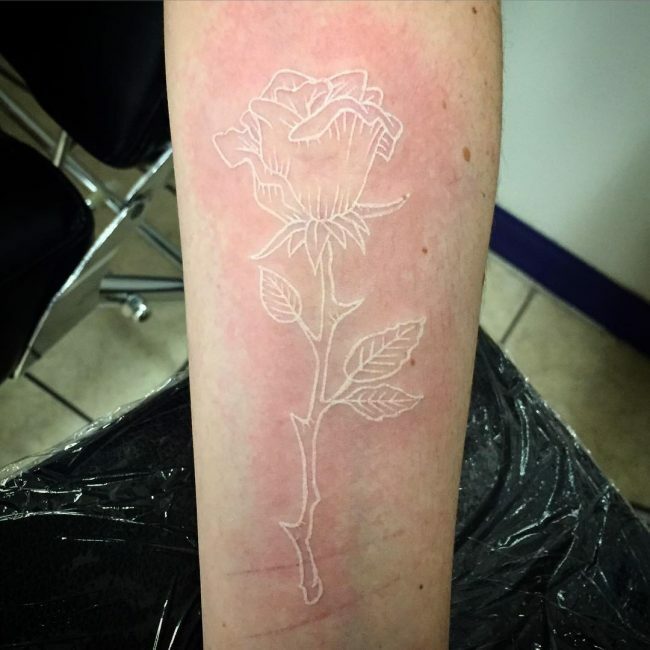 However, if you draw it with some thorns, it will be a symbol of loss, thoughtlessness, and defense. 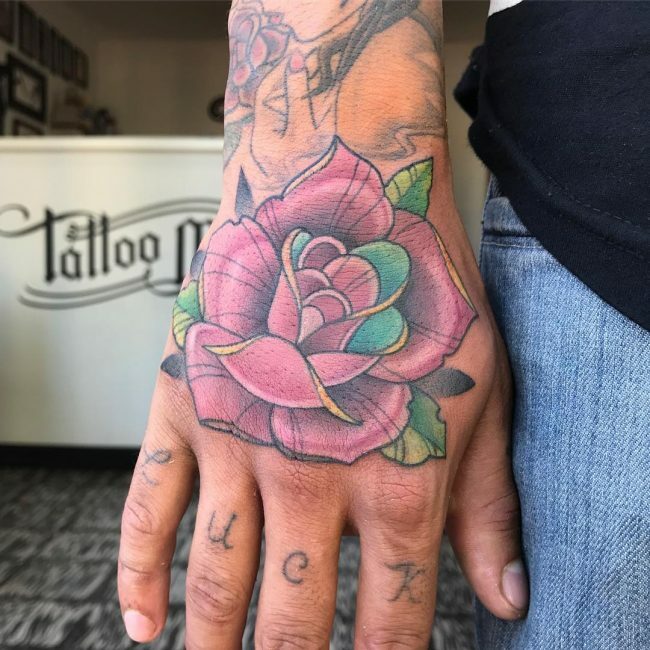 The number of petals and whether the bud is closed or open in your totem will also affect the meaning and symbolism of your tattoo. 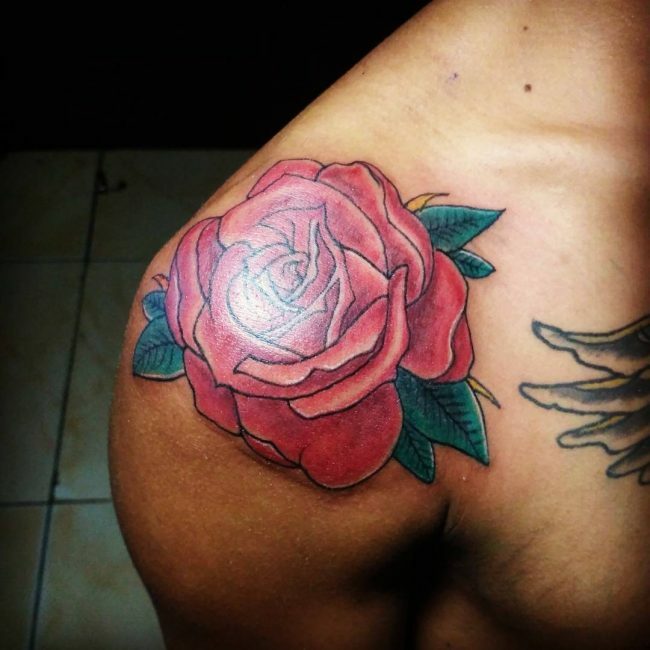 For example, a rose with eight petals means rebirth while one with seven can symbolize order and inclusion. 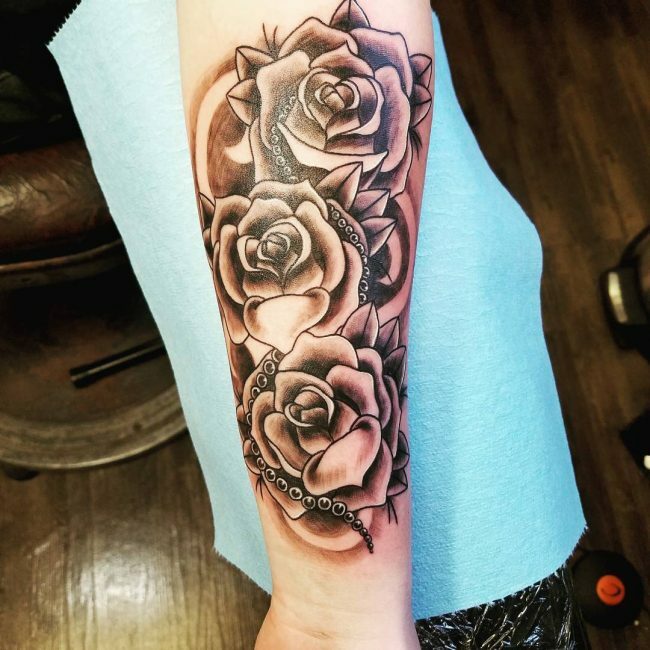 Rose flowers come in numerous colors, and it is important to know that the shade that you choose to have determines the meaning and symbolism of your tattoo. 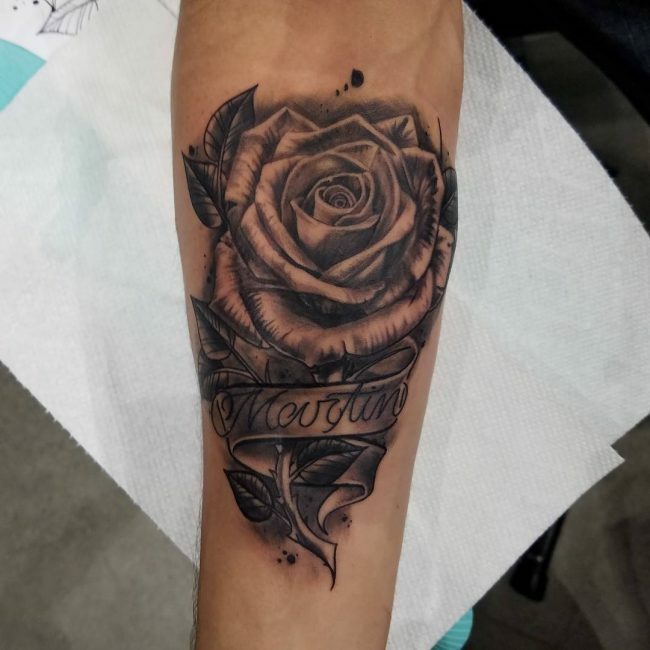 A yellow rose will stand for happiness and so you can have it to represent something that makes you happy while a white one is a symbol of purity and peace. 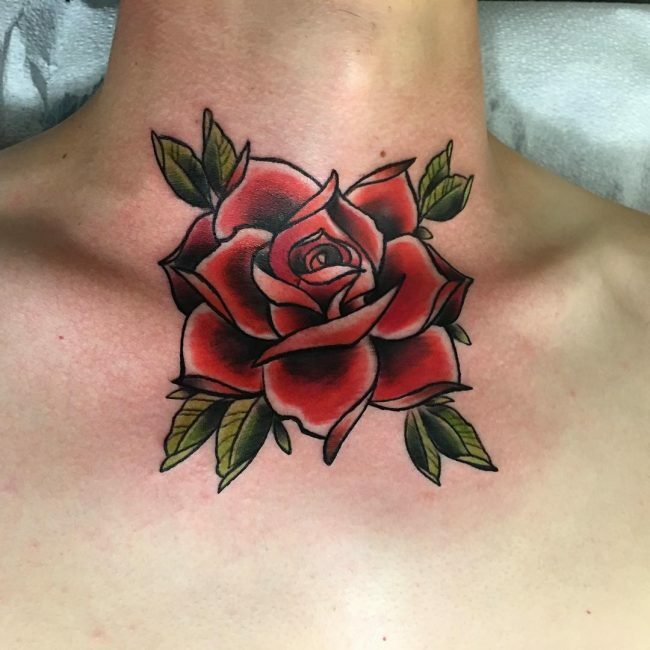 The red rose is what most people give to loved ones on Valentine and other special occasions, and so it is a symbol of passionate love, but it can also symbolize sacrifice. 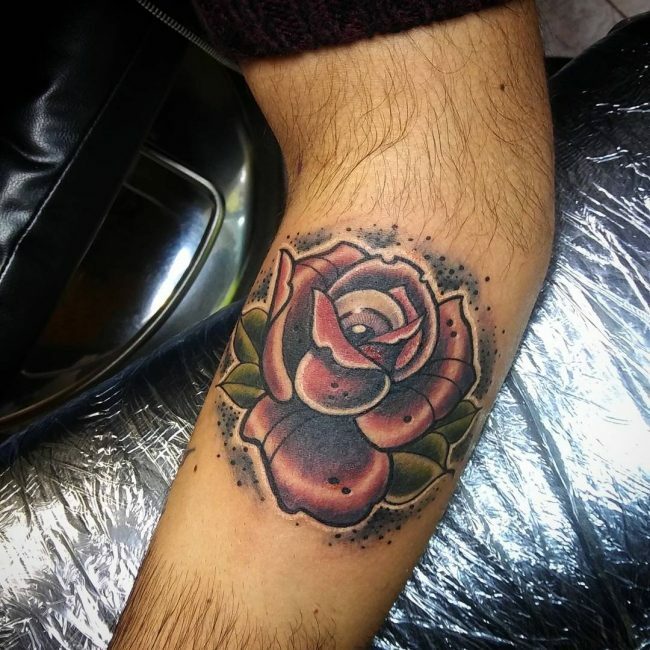 Having a pink rose as your tattoo, on the other hand, will stand for femininity, elegance, and gentleness while a blue one will mean something impossible or fantasy. 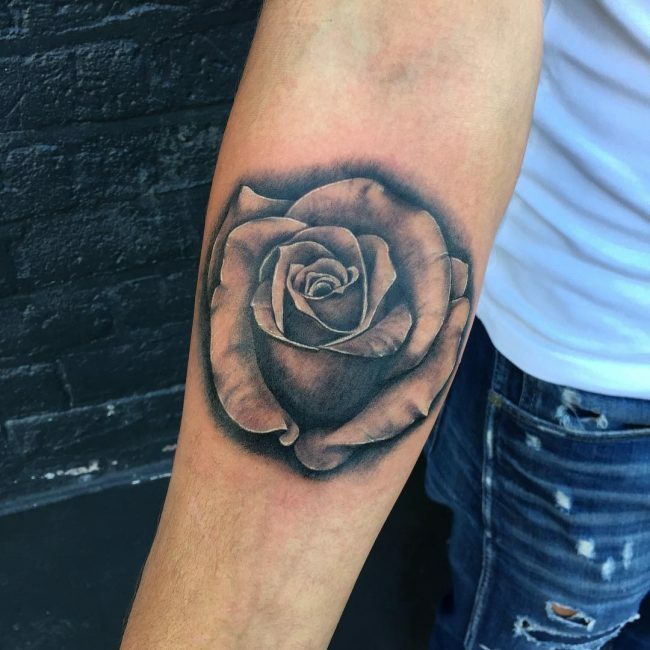 Black rose tattoos are also common, and people will have them to symbolize darkness or death of a loved one and also a sign of farewell. 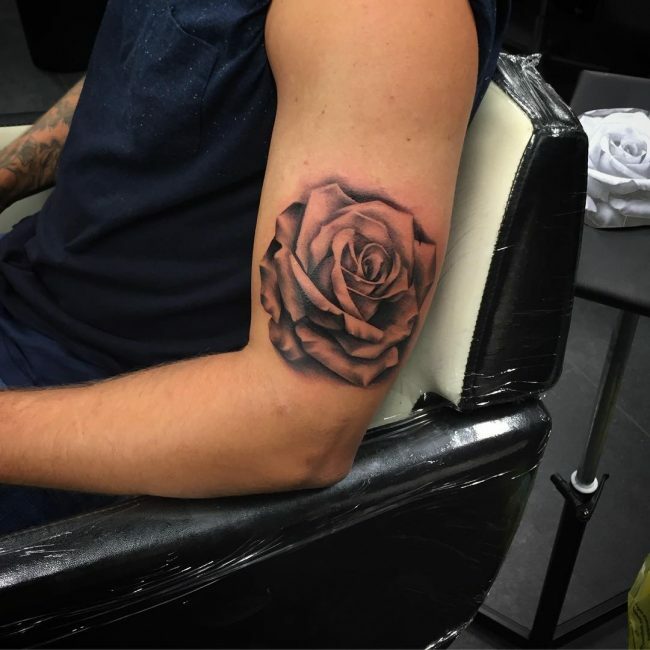 There is also the golden rose that is also the emblem of the Pope and it is a symbol of perfection or something without any blemish. 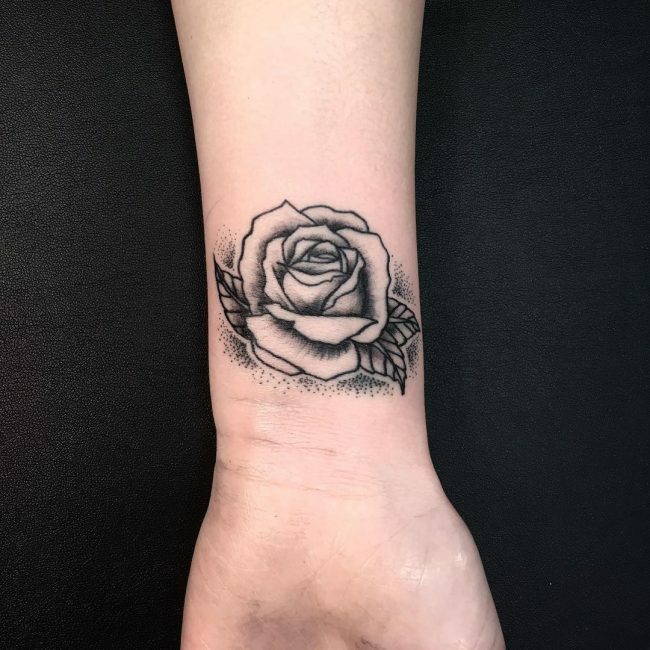 A rose flower might look like something simple or straightforward, but when it comes to tattoos, there are endless possibilities available. 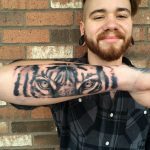 It is as versatile as any other kind of symbol, and you only need to get a little creative and use an experienced and skilled artist to get a distinct totem. 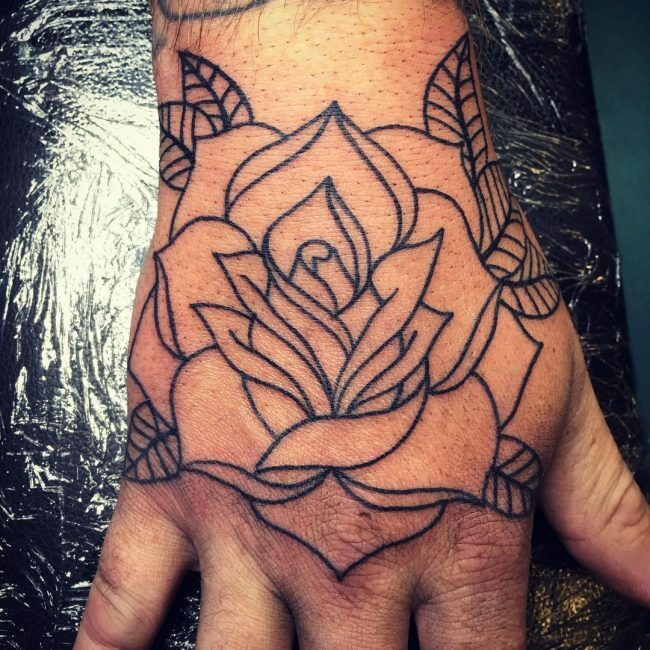 Here are some of the common rose tattoos that you should use for inspiration to create yours. 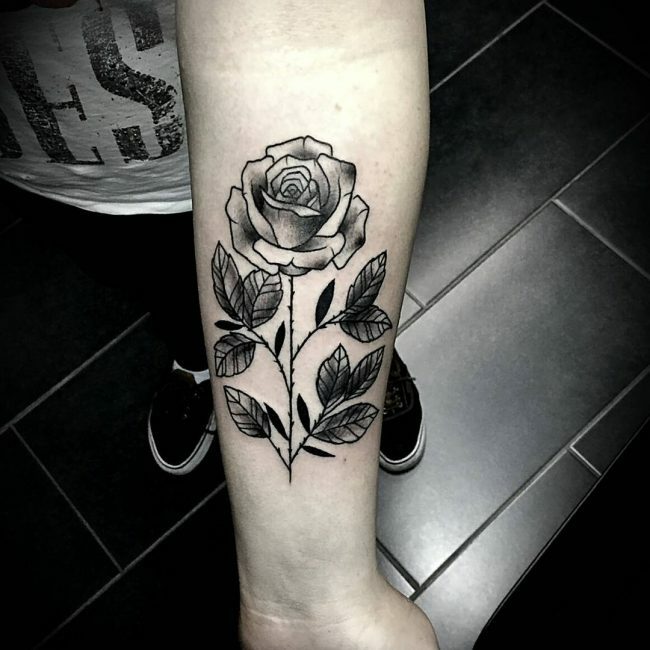 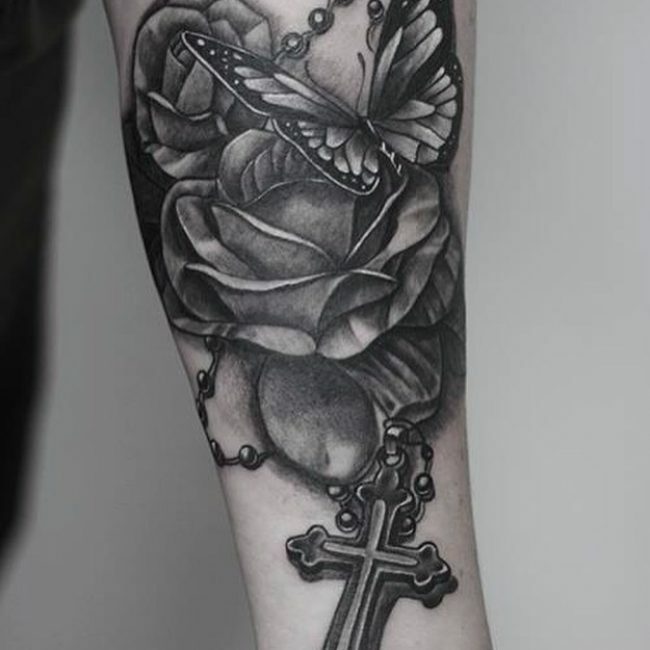 The black and white rose is one of the most common design variations of this tattoo. 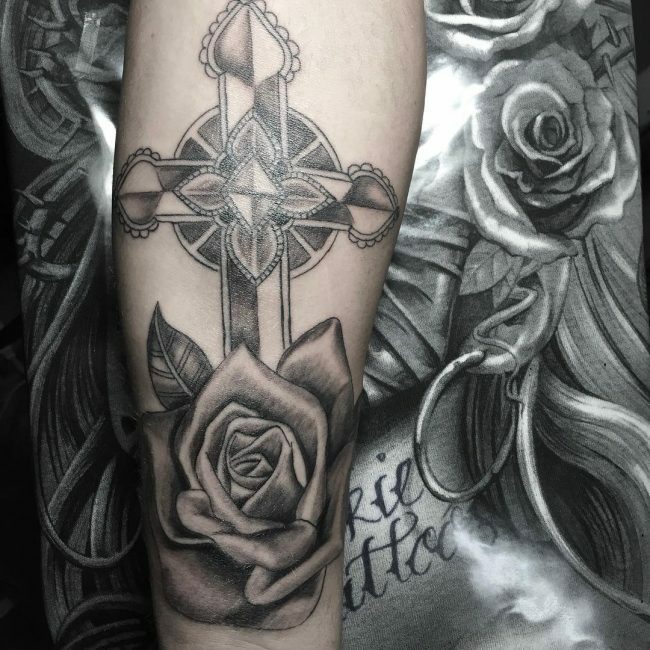 One of the elements that make it unique is the fact that most artists even those that are not very experienced can draw black and white totems effortlessly. 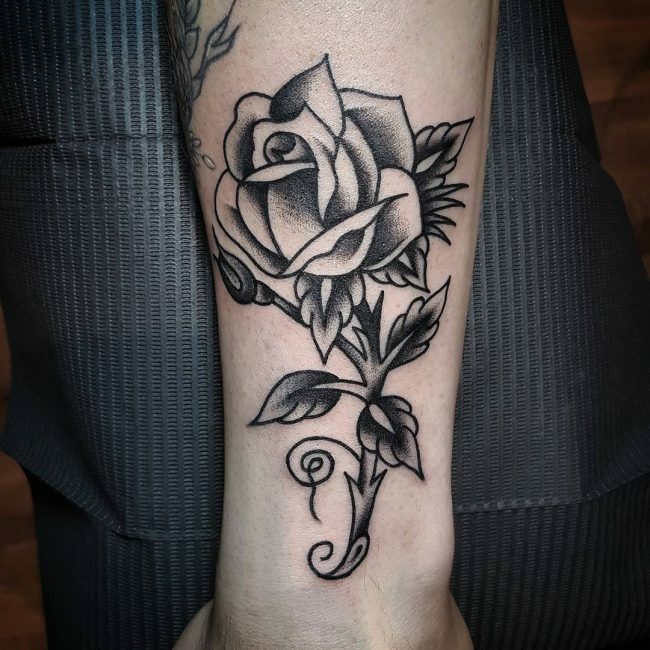 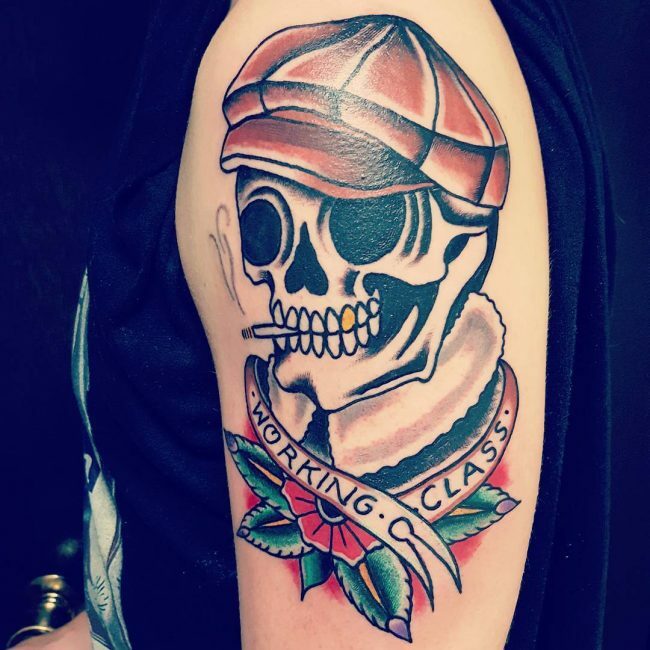 This tattoo also has a beautiful and vintage appearance, and it is perfect for individuals that prefer simple tattoo design that have deep symbolism. 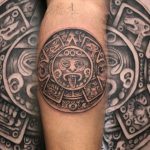 It is common for tattoo lovers to combine different images to make their totems more symbolic and also to give them a stylish and trendy appearance. 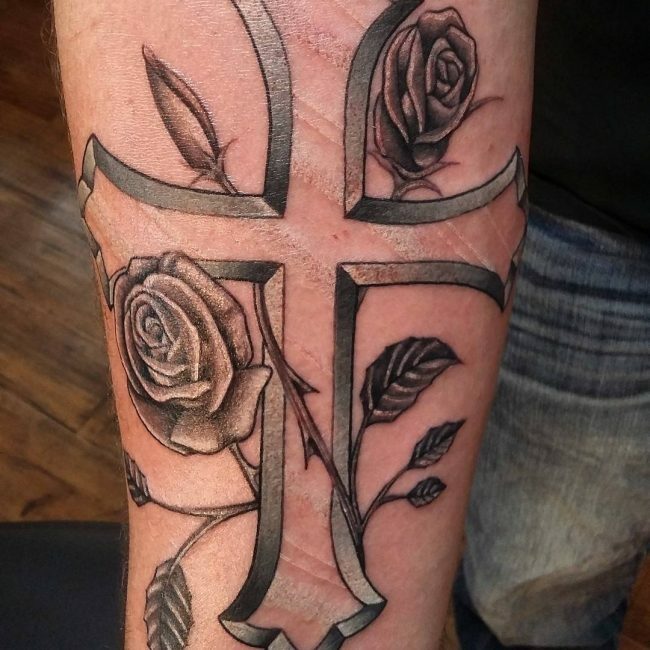 The cross is one of the most common things that people like to combine with a rose. 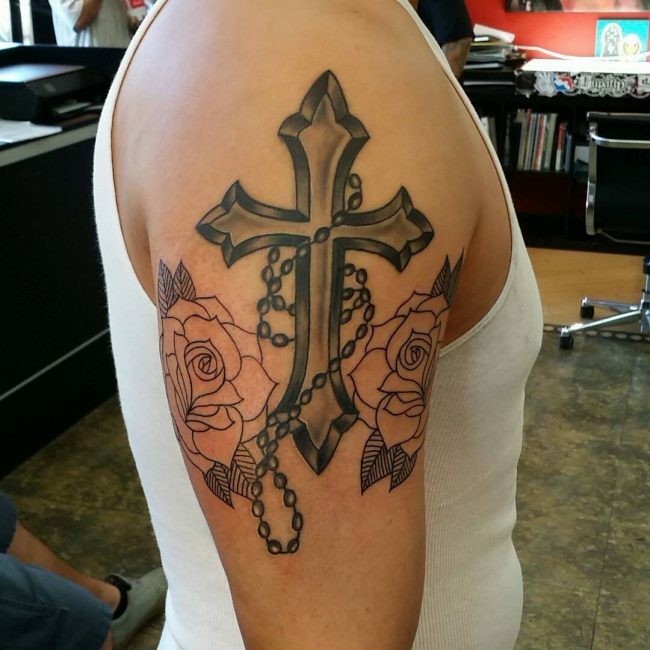 Adding the cross to your rose can give it a religious meaning because Christians use this symbol to show love and devotion to Jesus Christ. 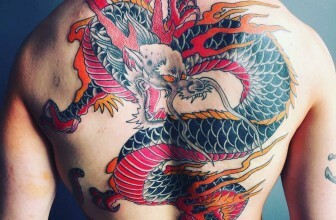 Three Dimensional body markings are the in-thing, and they have been in trend for the last couple of years. 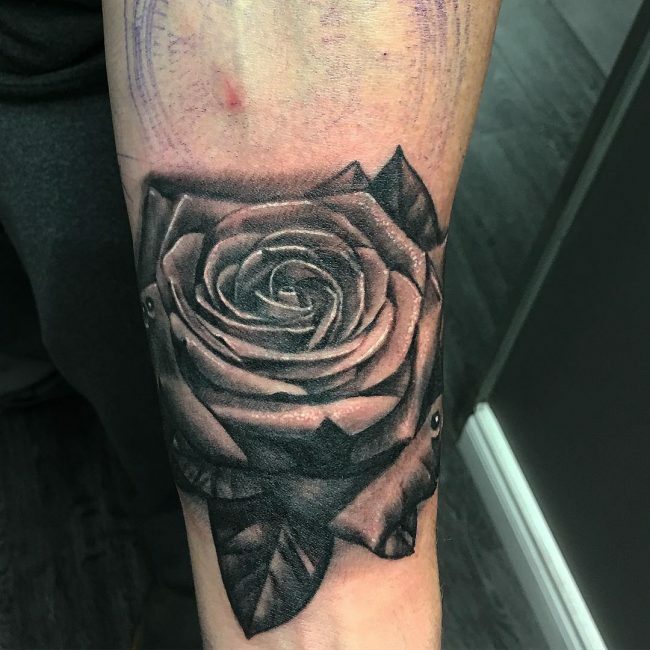 And so having your rose tattoos in 3D is an excellent idea as it will not only ensure that you have a unique totem but also help you keep up with the times. 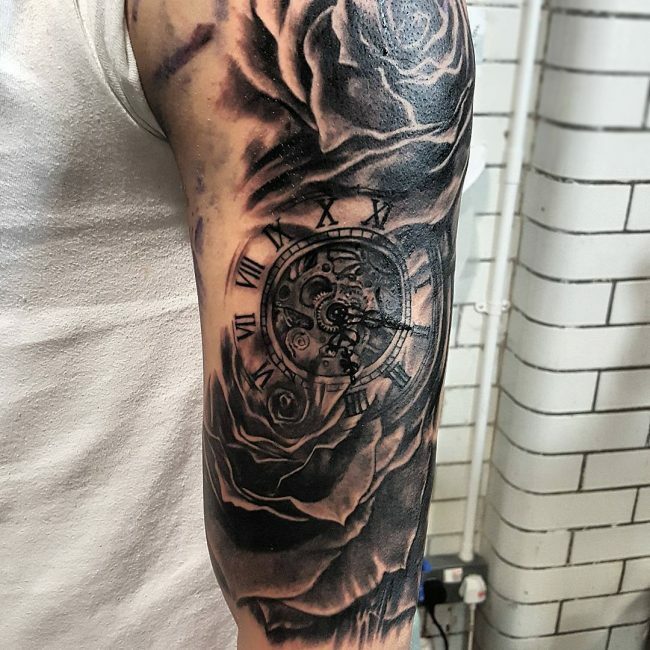 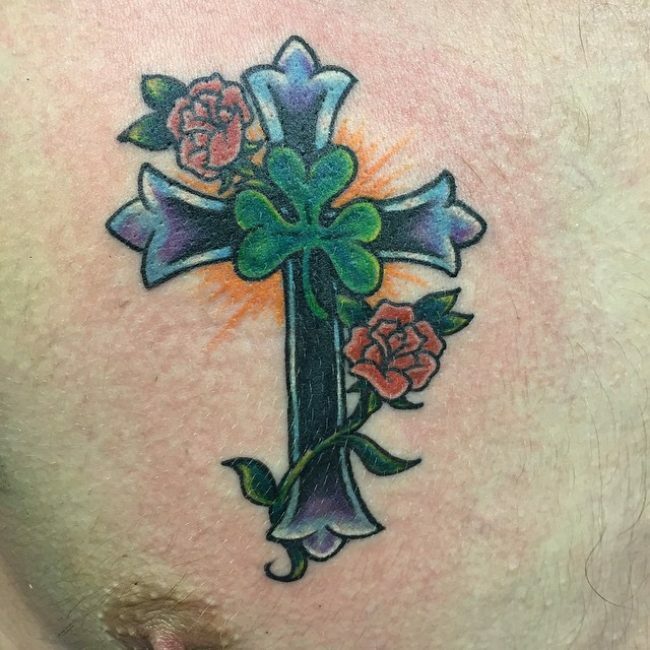 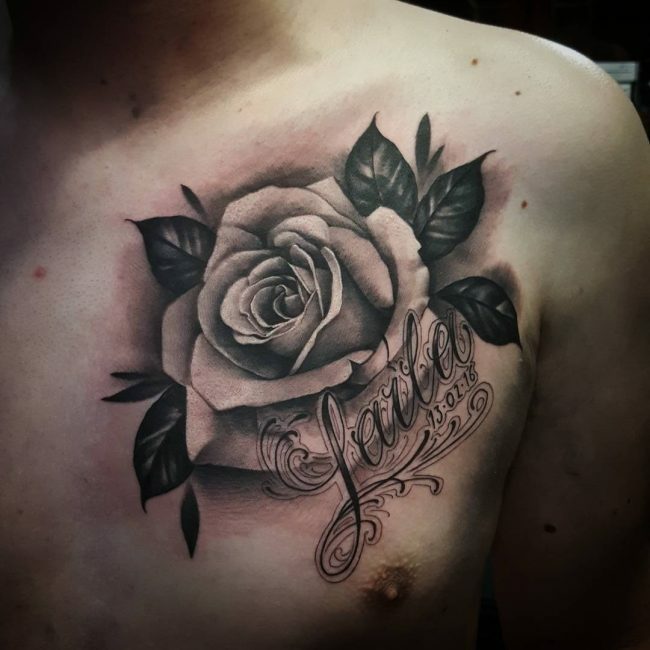 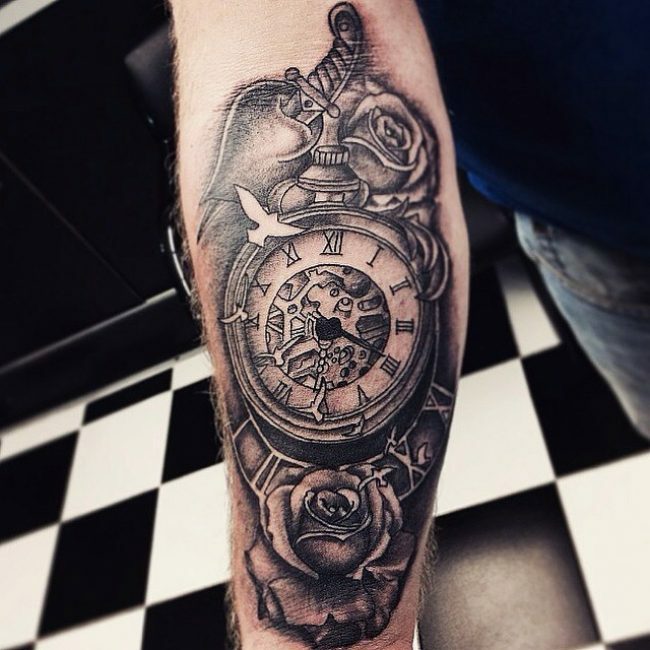 The only shortcoming with this kind of tattoo is that it is more complicated than the conventional ones and so you will need a skilled and experienced artist if you want to get it right. 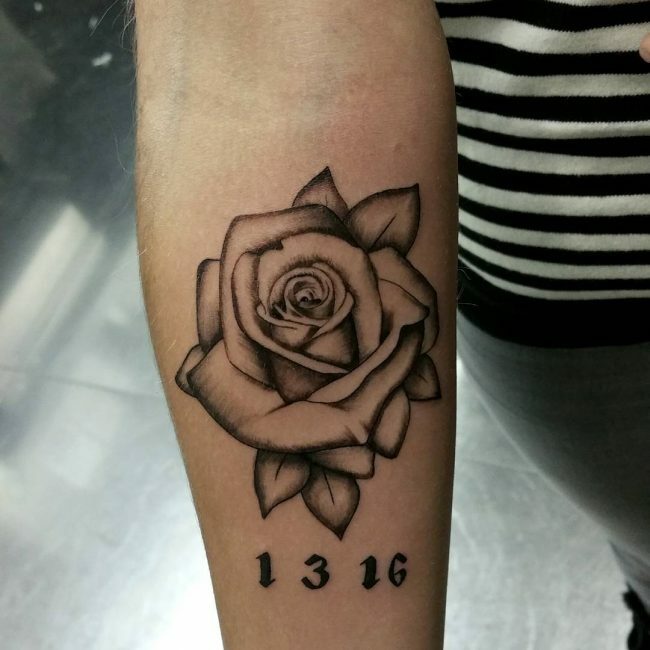 While a rose would look good in any ink and color, the white ink gives it a unique appeal. 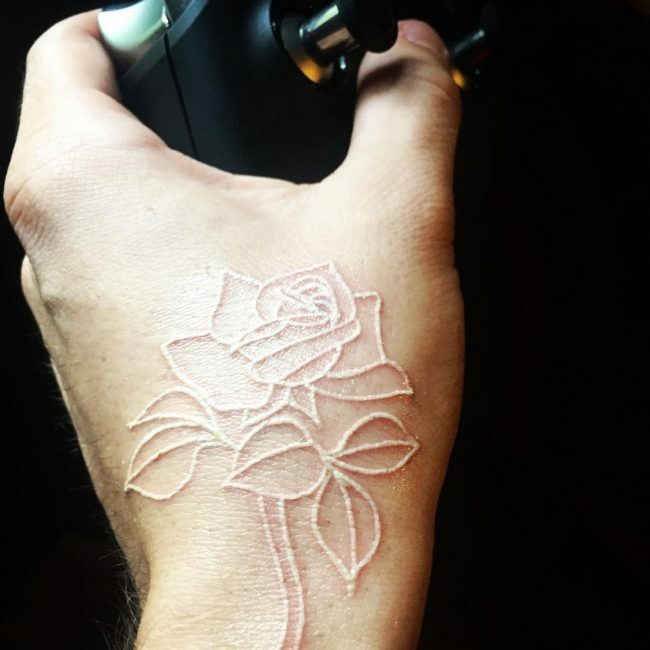 Instead of just going with the traditional or conventional tattoos design you should try white ink because you can almost be certain that it will look unique. 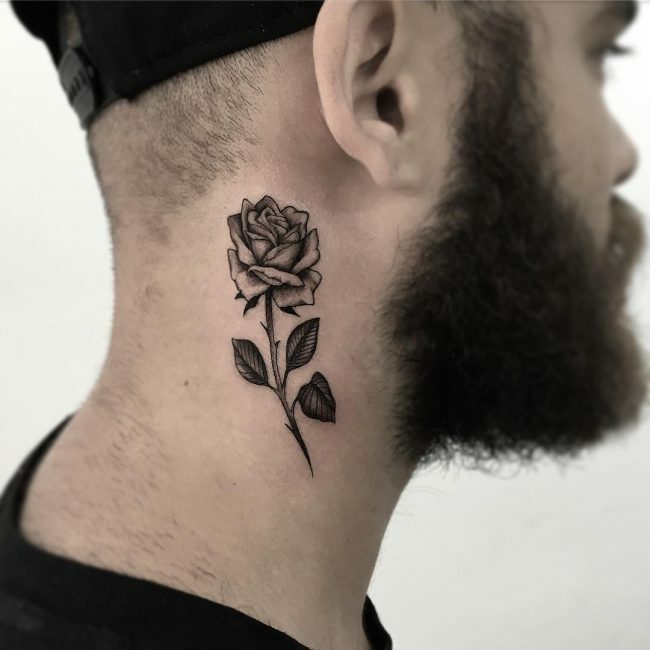 With this type of tattoo, you also get the opportunity to have it anywhere that you want because it is not as visible as those in the regular black ink. 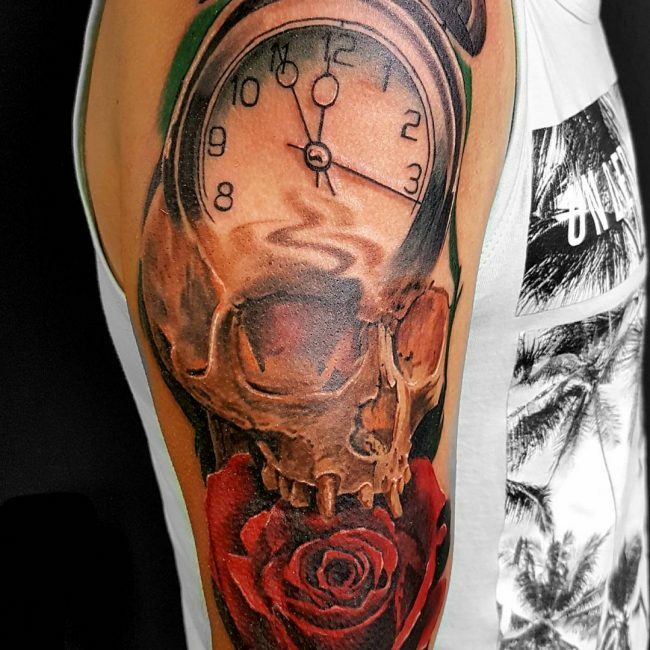 The skull can pair with almost any image to create an amazing body art. 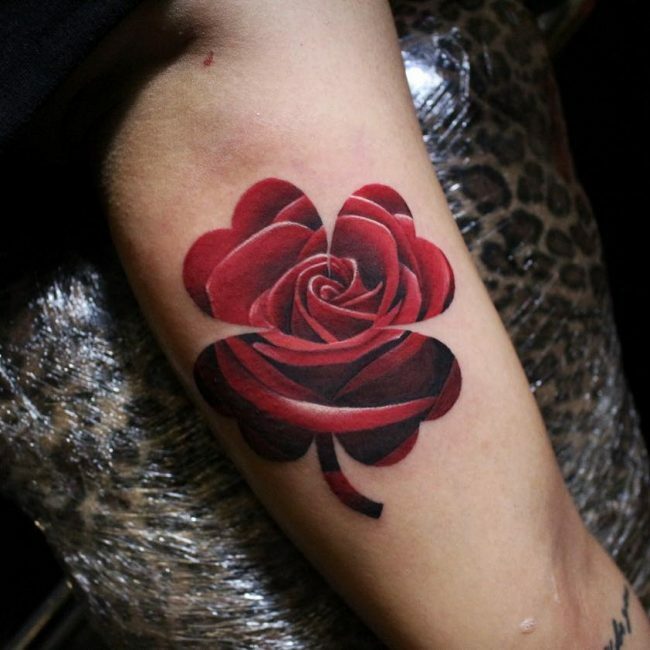 Although it is a very symbolic image some people prefer to combine it with a rose to give it, even more, symbolism. 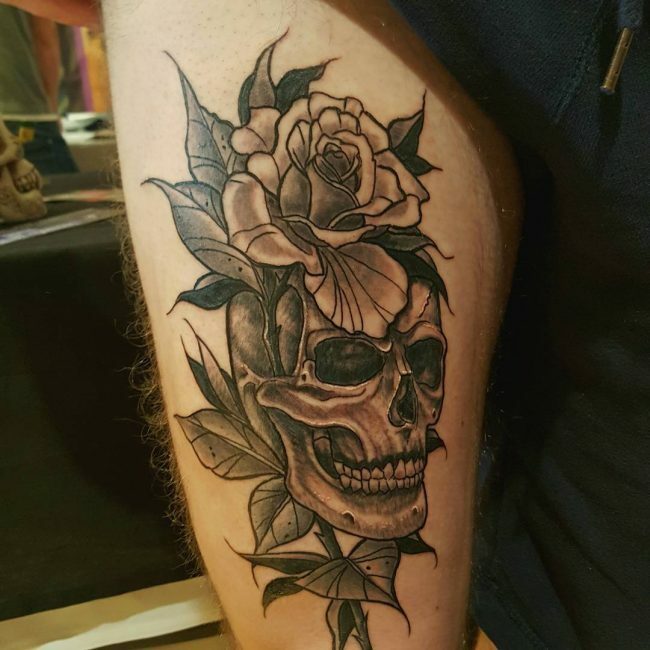 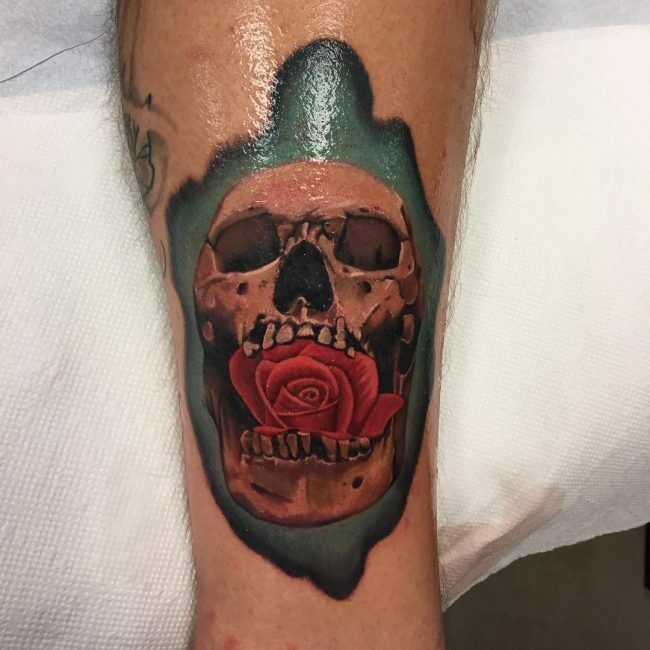 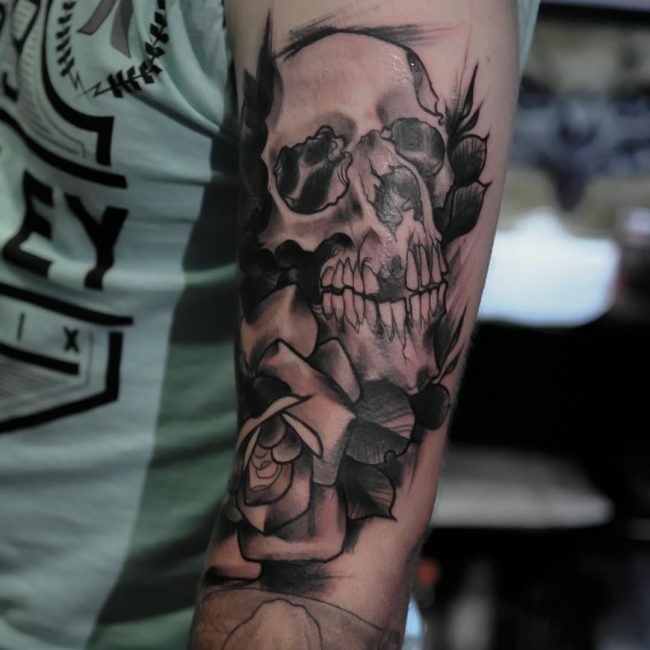 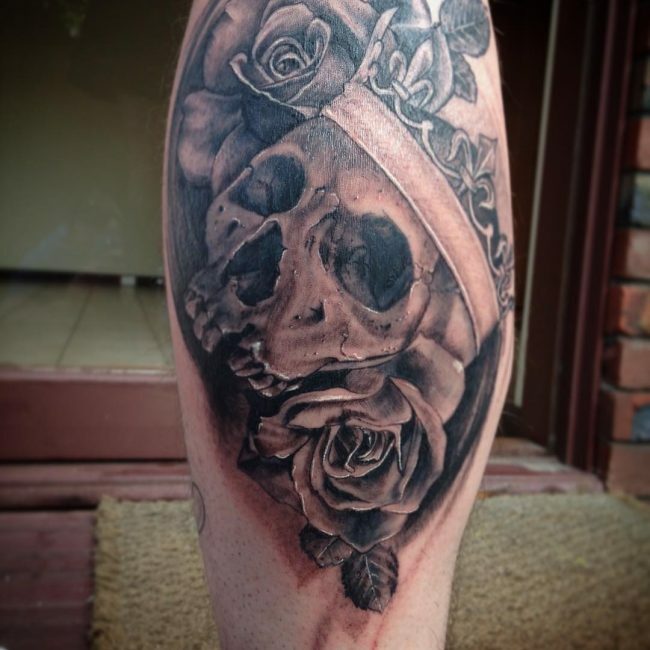 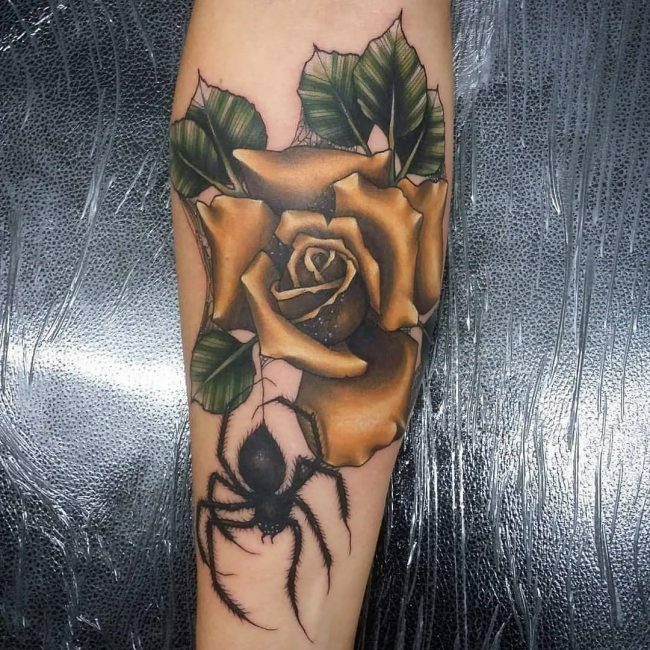 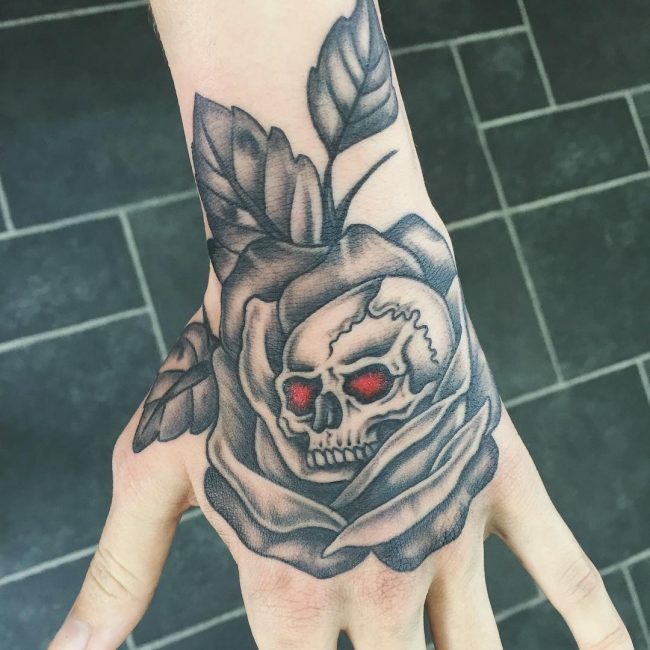 For this tattoo, you can draw both the skull and rose in black and white or have the skull head in black ink and spice it up with a colorful rose flower. 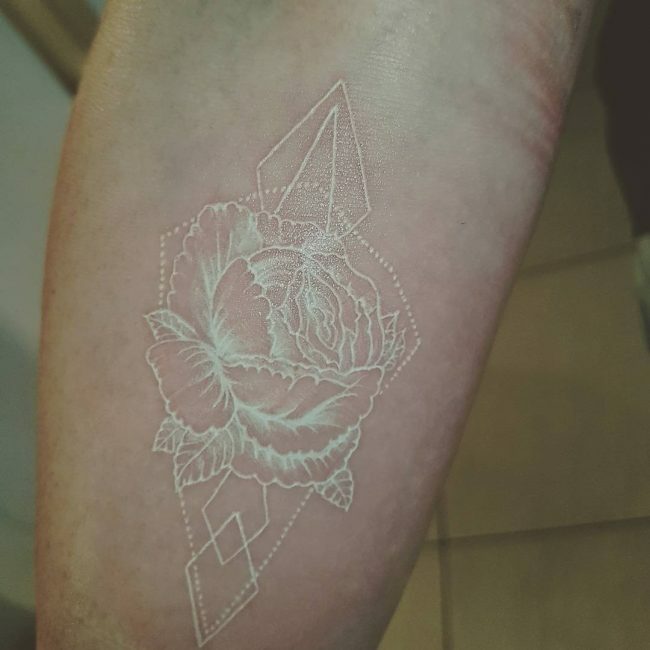 You do not always have to draw complicated designs for your rose tattoos because a simple sketch will still look beautiful. 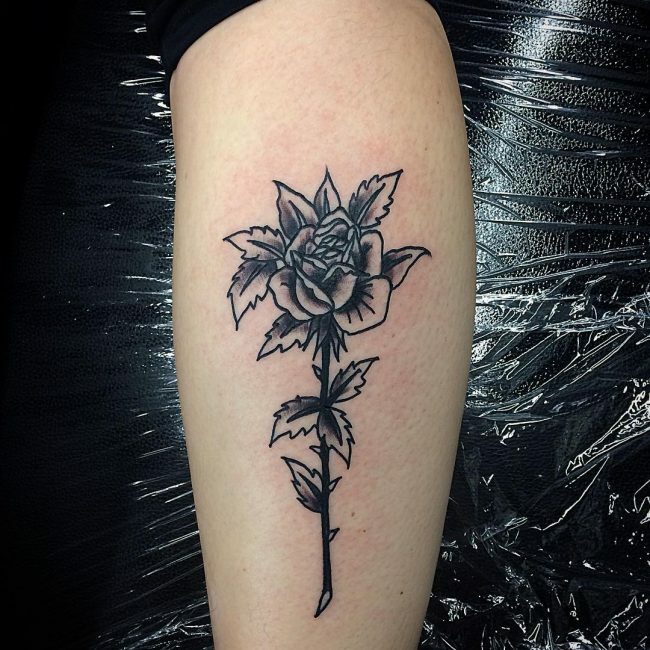 For this tattoo, you only have to draw the outline of a rose in black ink to create a simple but very attractive totem. 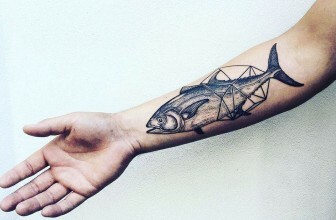 Some people will even get a little more creative and use dots instead of a continuous line which is also an impressive and unique idea. 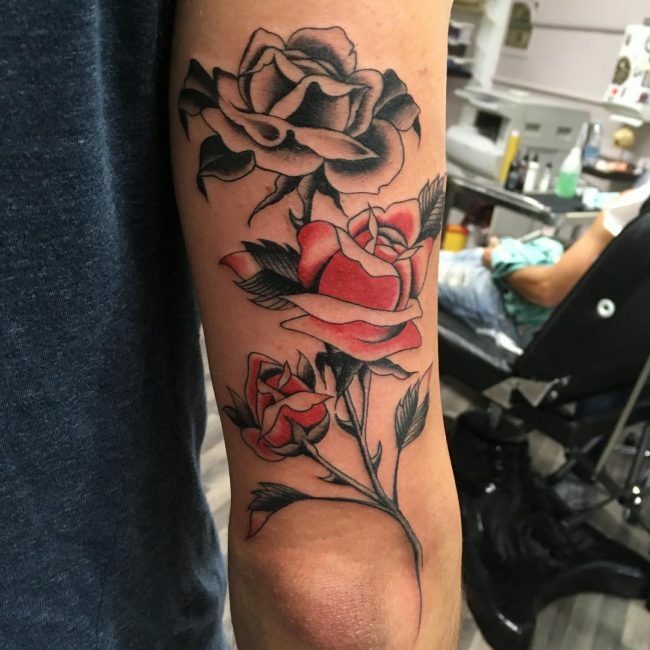 Tattoo enthusiast that want to have a rose but would also like it to be exciting and playful should have it with watercolors. 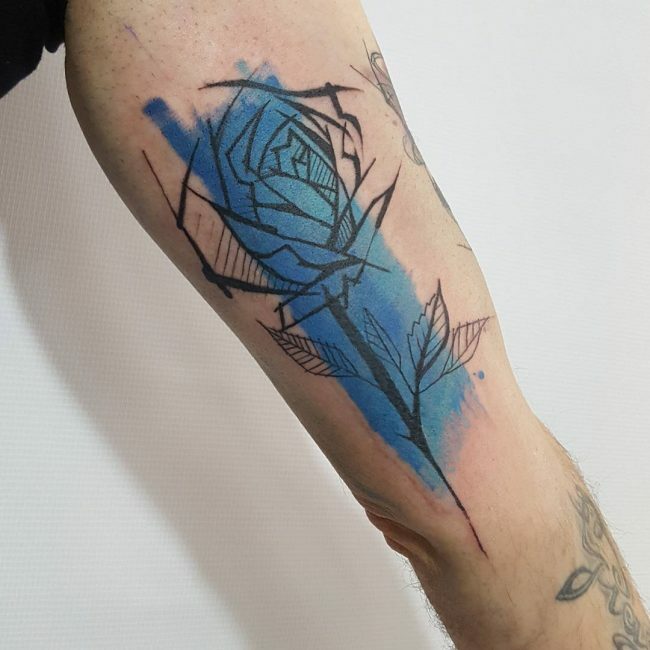 This tattoo entails drawing a conventional rose in black ink and a simple design and then spicing it up with watercolors to form a beautiful and modern totem. 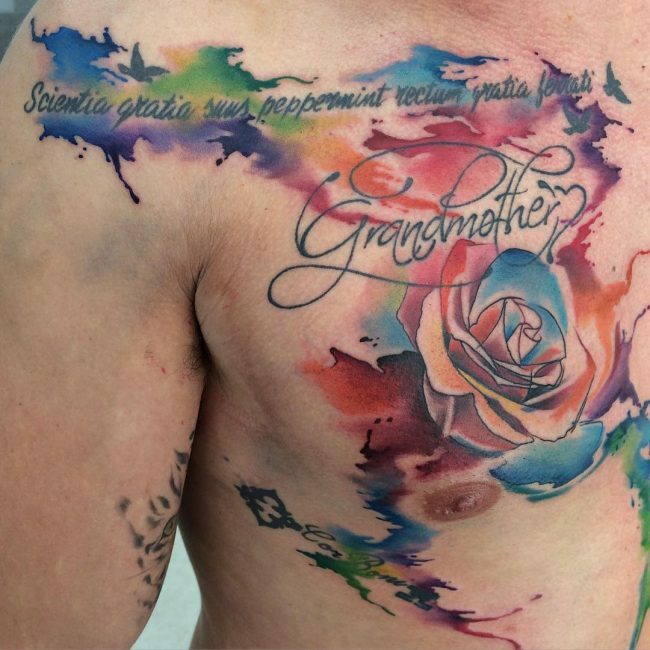 For this tattoo, you can use as many colors as you want but the idea is to keep them bright and stylish. 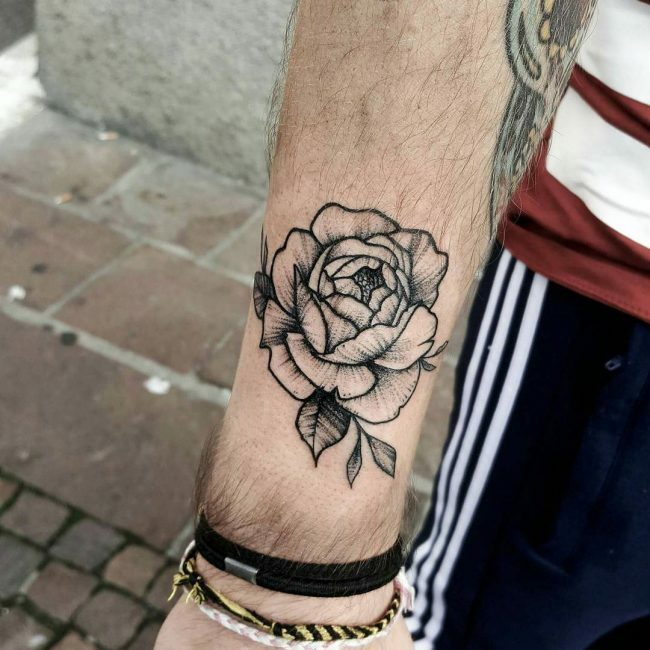 The appearance and the meaning of the rose tattoo are not restrictive, and so you can have it any part of the body that you want or where you find it most symbolic. 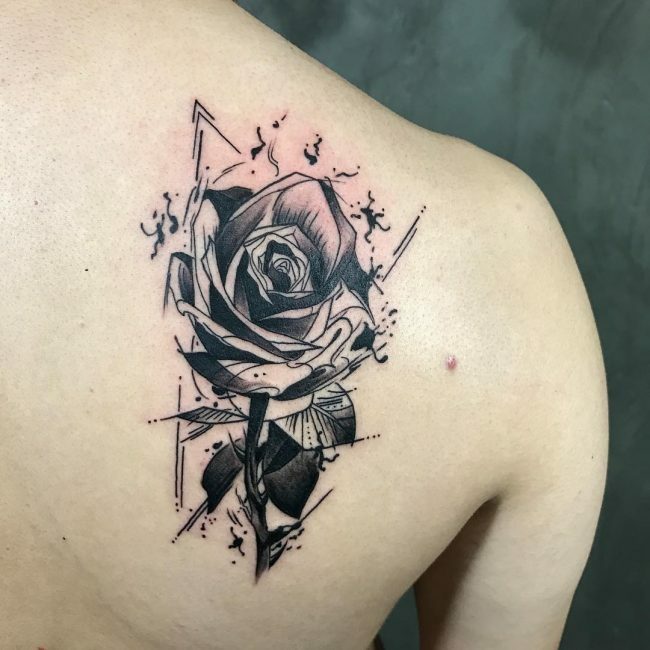 However, this also depends on gender because men seem to prefer to draw roses on their back and upper arm. 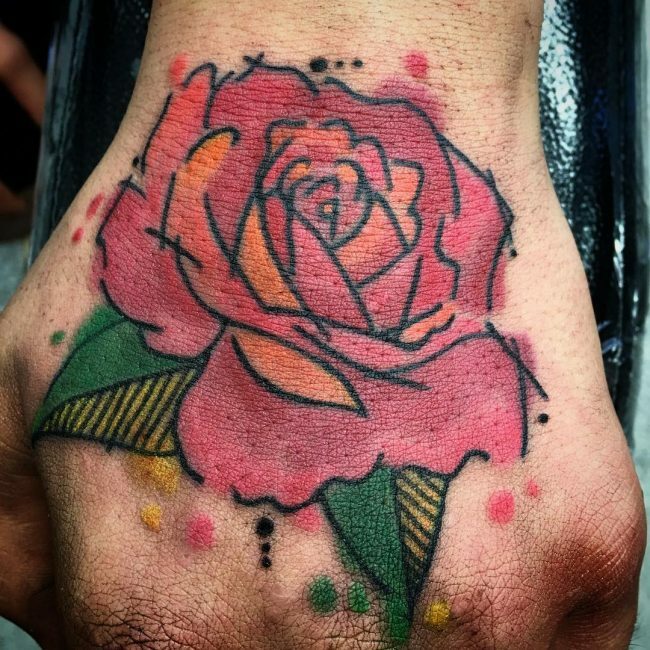 For ladies, the wrist, ankle, stomach and on the feet are the best placement areas. 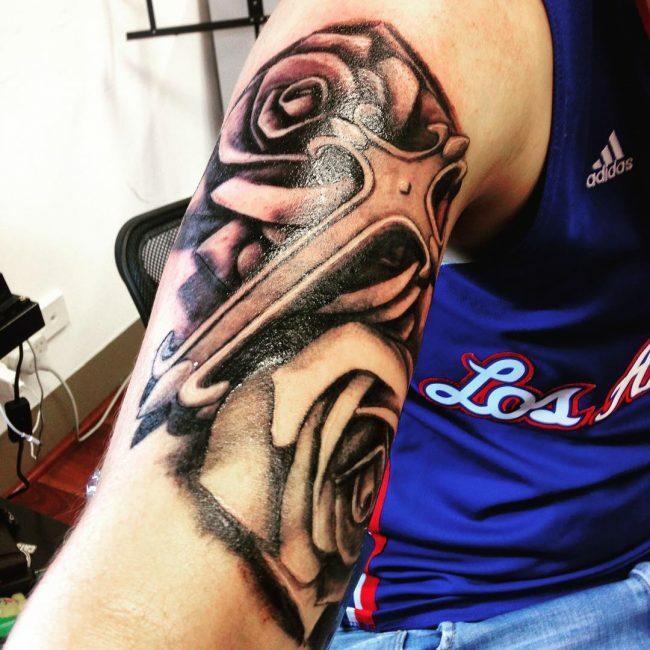 The size and design of the rose also dictate the placement. 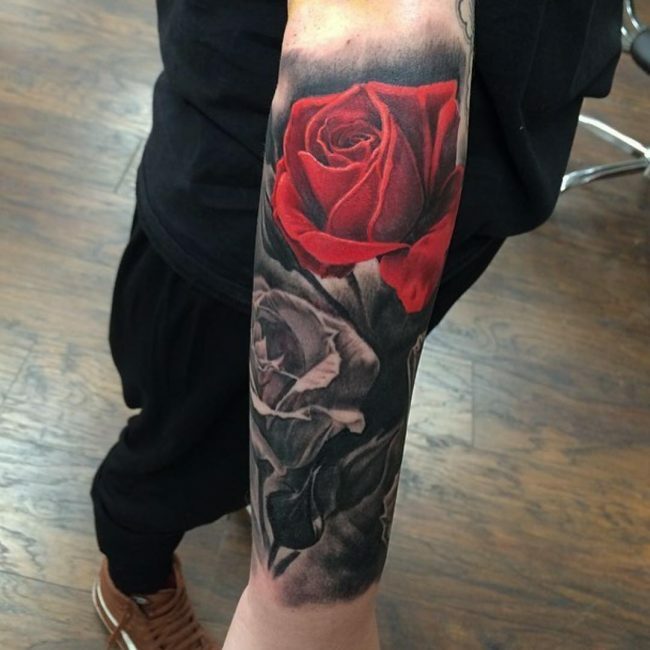 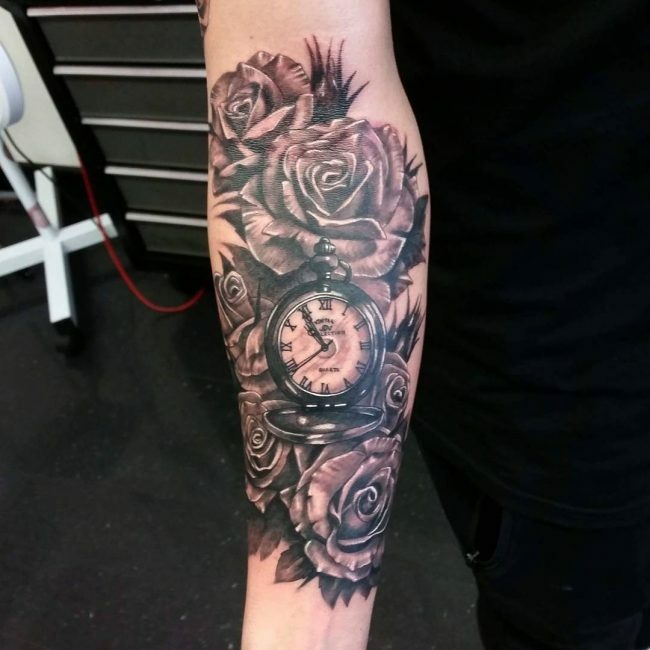 A big and colorful rose forms a perfect sleeve tattoo for men. 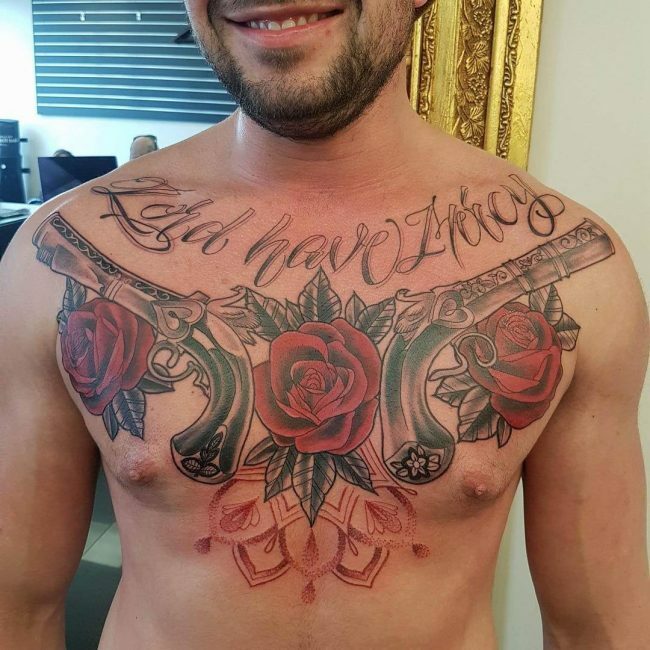 For ladies, it will be perfect on their back. 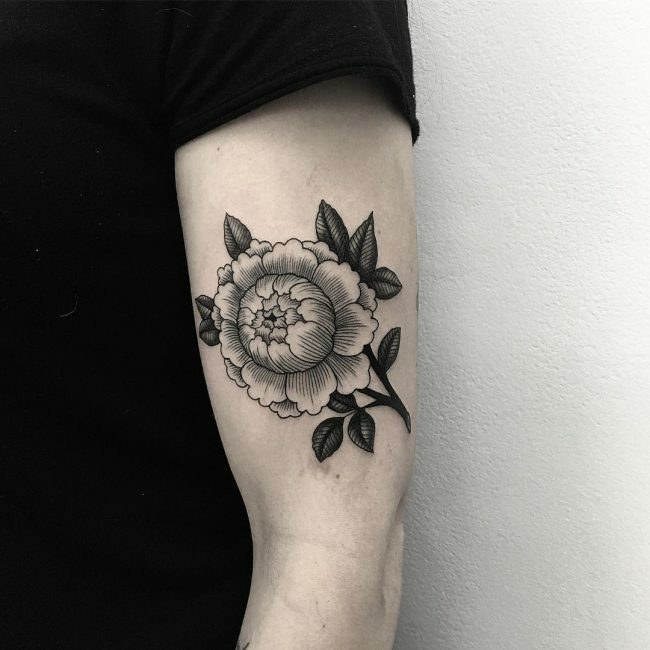 Small and simple flowers look best on the wrist or the fingers, but some people prefer to have them in unique places such as behind the neck or the ear. 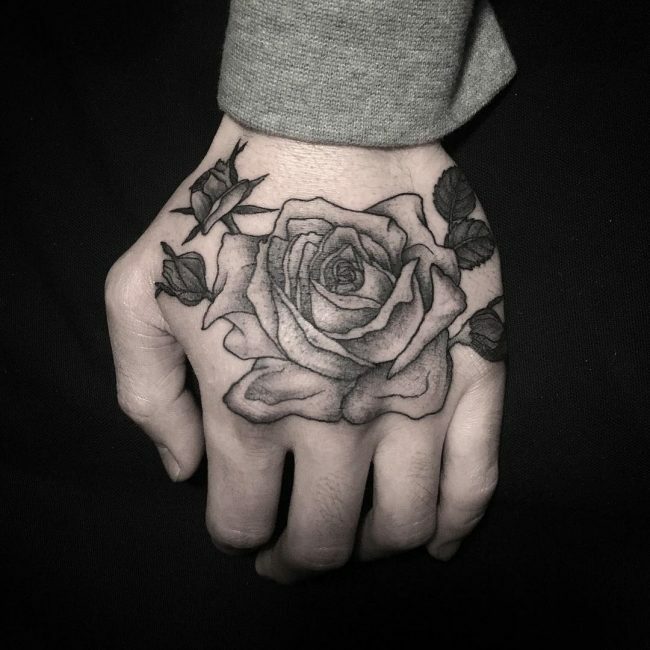 Couples that want to have rose tattoos also seem to prefer drawing them on their wrist. 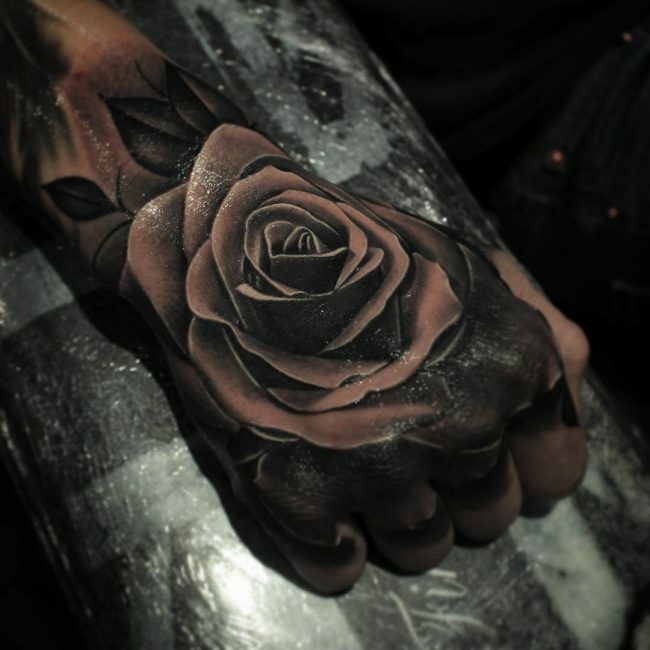 The rose is a beautiful and also very symbolic flower, and this is enough reason to ink it in your body. 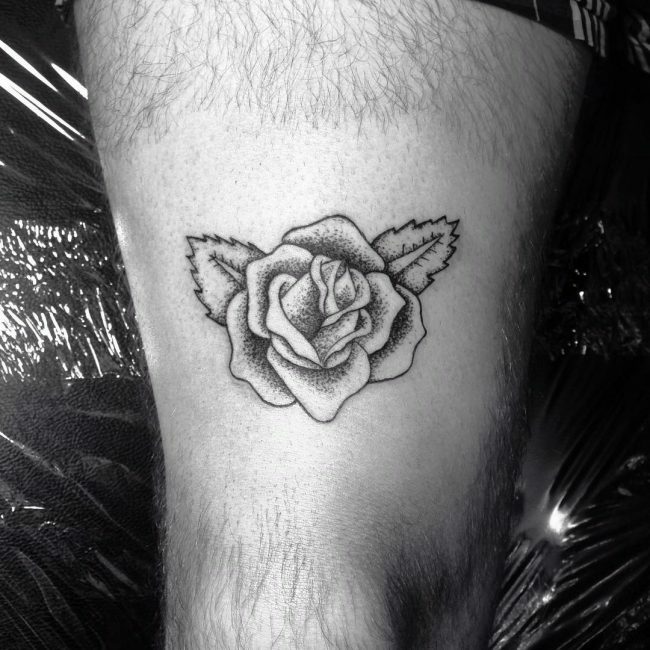 Whether you prefer simple totems or sophisticated ones, the rose will still work for you. 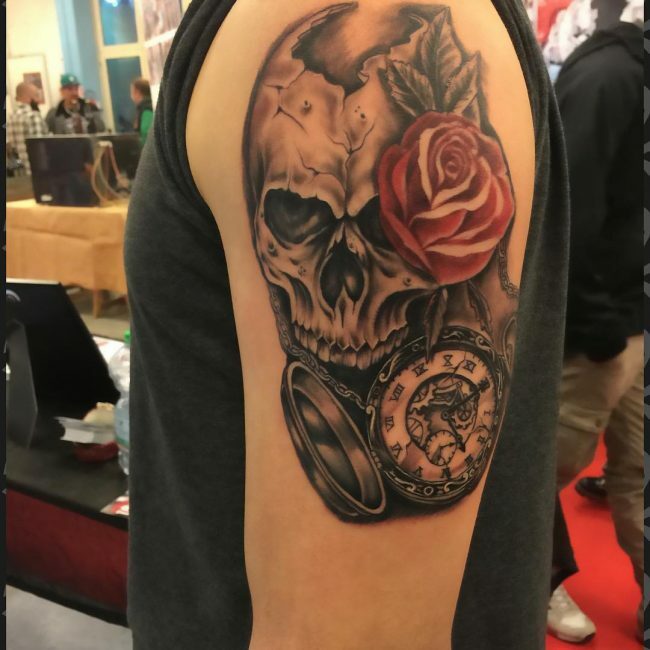 With this totem, you only need to come up with a unique design and choose a perfect placement area. 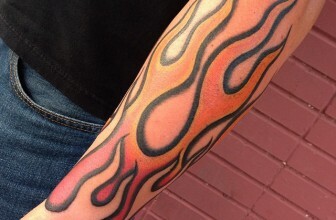 90 Hypnotizing Flame Tattoo Designs – Blazing Hot Body Art!